The Amy table is a round metal outdoor furniture set that adds a modern look to any patio or garden. The solid edge patterned design and the tightly interlaced lattice work in the middle combines style and comfort. Our Nicole outdoor dining table weighs only 24 kg and is made of high-quality sand-cast aluminium which means it can be easily moved around the garden when required but doesn’t have to be stored away or covered throughout winter. The Nicole table is perfect for smaller groups and casual family dining on warm summer evenings. Our Amy table & 4 chair set in White will turn any garden into an idyllic outdoor seating and dining area, perfect for entertaining guests. For a time-worn effect that remains strong throughout the ages, pop on over to the Amy in Antique Bronze, or its charming sister in Slate Grey. Don't forget to look at our gifts section above where we offer amazing discounts of 30-70% on a wide range of products to complement your purchase of the Amy table set. Kate chair - Recently back in stock - limited stock ready for immediate delivery - Place your order now to avoid disappointment. The table I ordered was delivered promptly. I had to move the large box into the garden. You really need 2 people for this because of the weight. It is sturdy and looks lovely and should last for a long time. The fixing instructions were easy to follow. The only criticism I have is that the plastic bolt covers are not deep enough to fit the length of the bolt once everything has been screwed in place. The protective covers could not be fitted on many of the bolts. Friendly and efficient communication, easy assembly! Very friendly communication, fast delivery (from England). Was offered a higher value article for something that wasn't available when I ordered - free of charge. Communication was efficient and very friendly, the order process fast and exemplary. 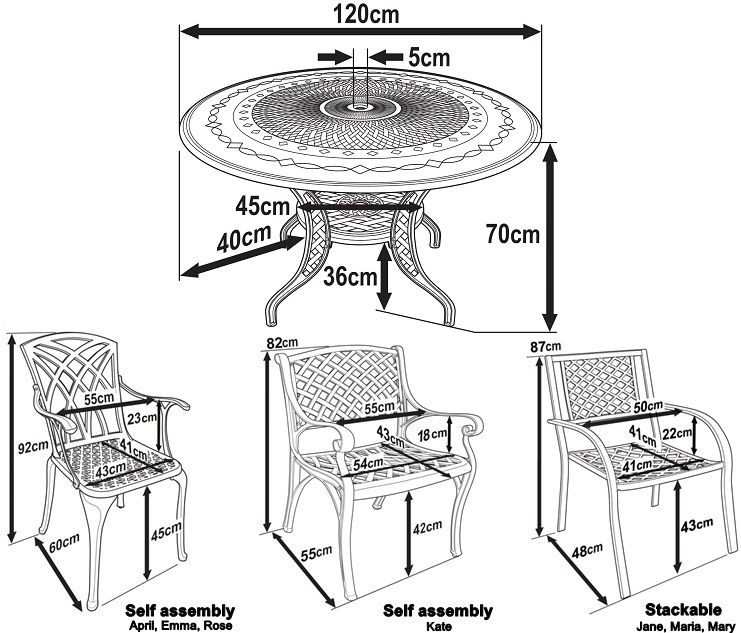 Assembly of the garden furniture is easy - although the included tools are a bit simple and I used my own tools instead. Overall I can fully recommend this retailer. Fast delivery. The table and the chairs are nice and the assembly was simple and uncomplicated. To recommend!